Since Reagan, Republicans have been on a “starve the beast” campaign – by which they mean eviscerate the government by taking away as much revenue as they can. Starving the beast has been the biggest bait and switch con game that has ever been perpetrated on the American people. And the most tragic. As Paul Krugman pointed out, Republicans offered popular tax cuts so that they could later cut popular government programs “as a necessity.” Oh, we’d love to continue providing low cost, effective medical care under Medicare, but you see, the country just can’t afford it … Of course we can’t. Billionaire hedge fund managers and Wall Street traders pay less in taxes than their secretaries. And most corporations pay little or no taxes. Starve the Beast was coupled with a clever campaign to make government appear to be a collection of bumbling bureaucrats who wasted tax money for pure pleasure. Long after it became politically impossible to stereotype racial and ethnic groups (with the possible exceptions of Muslims) it was – and is – quite acceptable to characterize government workers as shiftless, lazy and incompetent. As a result, once the Republicans succeeded in cutting government revenue to the bone and beyond, it became impossible to raise taxes – who wants to give any more of their hard earned money to a bunch of lazy bureaucrats? Never mind that most big government programs are far more efficient than their private sector equivalents. That’s a mere fact. Can’t let that get in the way of starving the beast. Bait and switch. Divide and Conquer. So, after starting with a surplus in 2000, Republicans used two wars, two rounds of tax cuts, and a giant giveaway to big Pharma, to get the country racking up debt like a drunken sailor. Along comes the Bush recession, and the debt accelerates, and the Republicans declare the debt to be an “emergency” and right on schedule immediately attack popular programs like Medicare, Medicaid, Social Security, Student loans –and virtually anything that doesn’t help the uber rich or the corporations suddenly must be cut if we are to stay solvent. Never mind that cutting Social Security to balance the budget is like attacking the mailman because your car doesn’t work. It has nothing to do with the budget – but again, that’s a mere fact. When you’re drowning the beast, facts don’t matter. So OK. The beast is drowned. Keynes is dead. Now what? Well, if past is prologue, welcome to the next Great Depression. See, the dirty little secret is that we never had a debt “crisis.” We had a jobs crisis. While Republicans were arguing about the faux “crisis” and the press and Obama joined them, we got a series of disturbing economic signals. Consumer confidence was down, manufacturing was off, May and June’s job numbers were pathetic. In fact, if not for a hiring binge by McDonald’s there would have been a net job loss in May. That’s something to hang your hat on: McDonalds accounted for what little job growth there was. What’s next, America gets saved by an uptick in Wall Mart greeters? Look. This whole drown the beast strategy has been nothing more than a stealth tactic for instituting an extremist version of a laissez faire, market uber-alles policy designed by and for the Plutocracy. And to be sure, it’s worked great for them. Today, the richest 1% owns 40% of the nation's wealth, and the top 10% owns nearly 75% of it. Income and wealth inequality in the US has been increasing rapidly since Reagan, (with a slight break under Clinton). In terms of income inequality, the US now ranks about the same as Ivory Coast, Uganda and Cameroon – countries not exactly noted for being prosperous, equitable and just societies. News flash for all the debt mongers, Tea Partiers and other assorted ignoramuses. You can’t run a consumer-based economy when the vast majority of consumers don’t have enough money to buy anything. After all, Paris Hilton can only buy so many yachts; Corporate CEOs can only purchase so many jetliners – even with their special jet tax credits; and Wall Street traders can only buy so many Bugattis. But middle and working class Americans need to spend their money on food, lodging, and other necessities. Here’s the dirty little secret: Republicans want the economy to fail. They want Obama to fail, and they don’t care who gets hurt in the process. They want these things, because the beast is in the bathtub and they can almost taste its demise. The pieces are in place for the Plutocrats final victory … an industry friendly Supreme Court; a Democratic Party that is either in collusion with the plutocrats, or so cowardly as to be neutered; a press that reports outlandish lies and objective facts as if they were equivalent; and a public that is dazed and confused and convinced the government is their enemy. But government isn’t the enemy. Laissez faire economic policies are. Every time we’ve tried them, they've produced profound income inequalities and the severe economic downturns that inevitably follow. With private industry sitting on top of some $2 trillion in profits, exporting jobs, and shutting down plants, only government spending stood between us and an economic Armageddon. So, congratulations, America. You’ve finally gotten big bad gubmint off your back. 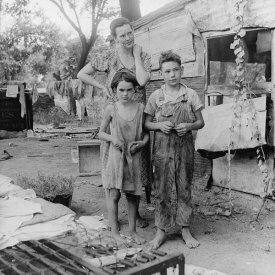 Enjoy the coming Great Depression.